I just got back from a quick trip to Yellowstone and The Grand Teton National Parks. Linda and I had an amazing time in an amazing place. If you have never been to these special places you have got to go. They are wild and powerful places. You can't start off National Park week without a pic of Old Faithful. 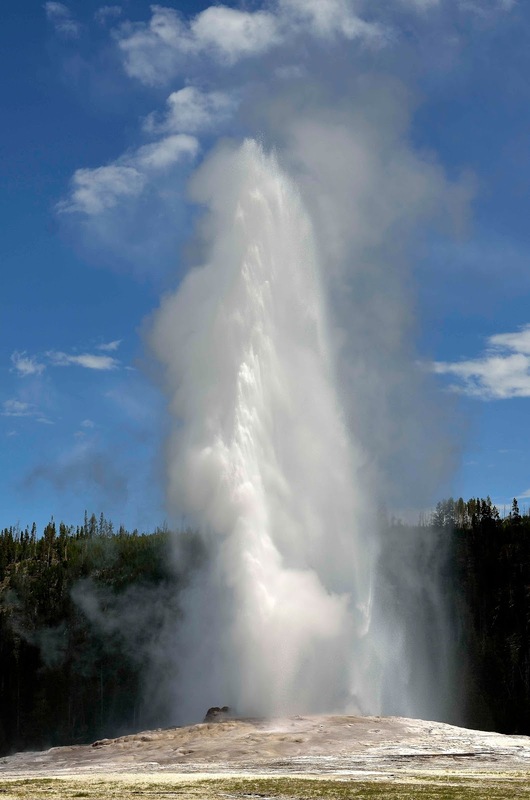 I can't even imagine how many times this geyser has been photographed. There must have been 2000 people there for this one eruption alone, who were clicking like crazy. My goal - just a nice pic to remember this great place by. Again - background for me was important. As few as people in the frame was another consideration. Just by moving a little bit up and down and side ways made it happen. That is all that it takes - and the nice thing about Old Faithful. You know about when it will happen. So you can walk around and look for a good place to shoot from. Very nice. This place is definitely on my 'todo' list for photo ops. Do it - way better than Disneyland that is for sure.